Read the Bluegrass Blog for the latest news on the G2 Bluegrass Band from Sweden, #1 European Bluegrass Band 2007 - especially the appreciative comments by John Lawless on the music from their new album, Untapped routes. One track from the album, the song 'Still standing', was released today as a digital single and can be bought on Klicktrack and heard on their website. Read also how the band are searching for a base in the Nashville area for their forthcoming US tour. Rainer Zellner sends the April 2010 newsletter for his Music Contact agency. Sign in here for Music Contact's USA Roots e-newsletter. YouTube, video, and other media links on the artists presented are on the Music Contact website. Dangem Bluegrass Banjo of Craigavon, Co. Armagh, Northern Ireland, have been appointed as new distributors for Stelling banjos, and have taken delivery of their first batch of these top-class instruments. Dangem have now become the sixth Stelling dealer in Europe, in addition to their long-standing association with Deering banjos. Dangem also host monthly Bluegrass Get-Togethers in Lisburn, Co. Antrim, and an annual weekend Banjo Camp in Northern Ireland, the second of which was held last month. Thanks to Italian guitar wizard Beppe Gambetta for news - sent from Australia, where he will perform at the National Folk Festival, Canberra, and at the Fairbridge Festival, Perth, in early April. Beppe returns to Italy for the all-star Acoustic Nights in Turin (Torino) and Genoa (Genova), which were announced on the EBB on 21 February. More details are on his website. In the middle of May he begins two months of touring in Italy, Germany, and the USA, returning to Europe in July for the Rossiglione Folk Festival (23-5 July) and the 18th International Acoustic Guitar Workshop at Ambroz Pod Krvavcem, Slovenia (1-8 August). Twenty-one of the thirty places on the Workshop are already taken. Instructors will include Kathy Chiavola (USA) for vocal training and songwriting. Beppe will then be touring in Italy in August and September, in the USA in October, and in Germany, Austria, and Switzerland in November-December. A UK tour is being planned for March 2011 - promoters who are interested can contact Loudon Temple of the Brookfield Knights agency by e-mail. 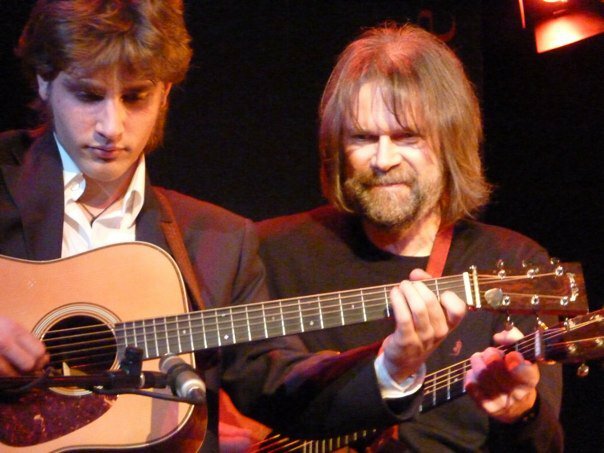 The German record company Acoustic Music Records has just released the Beppe Gambetta collection, a compilation of fifteen tracks from previous albums. It is available directly from the Acoustic Music Records website or at Beppe's concerts. Full details of Beppe Gambetta's schedule as it stands at present, together with many other items (YouTube favorites; peformances, recordings, and books by other musicians; and his comprehensive list of favourite restaurants in many countries), can be found in his newsletter, which you can read here. 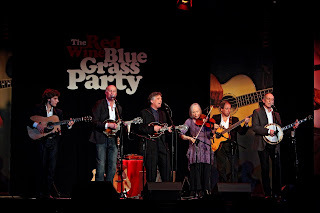 The “Bluegrass Row Contest 2010”, a new international feature for bluegrassers to serve as opportunity to show their talents across the worldwide YouTube scenario. For this contest a medley of three tunes in a row has to be played to become eligible for the Best Bluegrass Row Arrangement 2010, where creativity will draw the parameters for a winner’s election. This is a project running for 6 months, the winner will be announced on September 30, 2010. Please do not hesitate to incentivize yourself and any of your bluegrass picking friends to enter this first and unique bluegrass world contest challenge with creativity and with a full bluegrass instrument line-up. Red Wine Bluegrass Party #2 on Friday 19 and Saturday 20 March was another big hit! For two nights the air of our hometown, Genoa (Genova), was filled with the sound of banjo, fiddle, mandolin, guitar, bass, and with the beautiful vocal harmonies of our special guests, Laurie Lewis & Tom Rozum. The show was divided in two sets: in the first one Red Wine played alone, and then invited Laurie & Tom for a few more songs together. 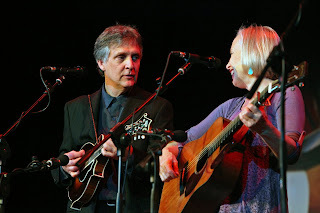 After a short intermission, Laurie & Tom opened the second set with a beautiful a cappella hunting number, and then played several songs as a duo, switching from guitar to mandolin to mandola to fiddle to twin fiddles! They invited back Red Wine on stage to end up the show with more numbers together. What a thrill to play and sing with such great musicians! The encore saw a surprise visit on stage from our guest friends Beppe Gambetta (on Friday) and Lowell Levinger alias 'Banana' (on Friday and Saturday), for a rendition of 'The Old St. Sabbath' and 'My old Kentucky home'. Everybody left the the Theatre of Gioventu' happy and with a lot of great memories, and we've already started working on the Red Wine Bluegrass Party #3 for 2011! One of the pleasures of the European World of Bluegrass Festival at Voorthuizen in the Netherlands is seeing familiar faces; another is seeing new acts; and a third is seeing a familiar face in an new setting. Danny Sheerin (pictured left), singer and guitarist with the Irish band Carmel Sheerin & the Ravens, is scheduled to appear in a band showcase at 17:30 on Saturday 15 May 2010. 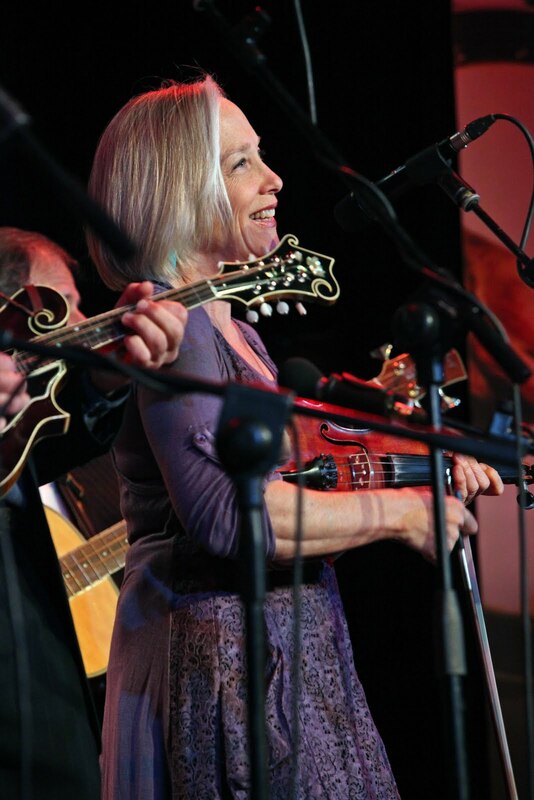 This is not Danny's first time at the EWOB Festival, as Carmel & the Ravens showcased there in 2005, won the #1 European Bluegrass Band award, and went on to represent Europe at the IBMA's World of Bluegrass in 2006. Danny has a website of his own under construction. Full details of the EWOB 2010 programme can be seen here. The current (March-April 2010) issue of the US magazine Bluegrass Music Profiles includes a 'Promoter profile' on the European World of Bluegrass Festival at Voorthuizen, the Netherlands. This article, written by Don Kissil (formerly editor/publisher of Pickin' magazine, USA), will also be appearing in translation in the venerable Japanese bluegrass publication Moonshiner this spring. This year's event will be the thirteenth EWOB Festival, and the twelfth held at 't Trefpunt, Voorthuizen. The Festival website includes a new press release, issued yesterday (22 March 2010), which gives full details of EWOB 2010 and can be read here. Thanks to Country France for the news that the latest issue of the French-language country music magazine DreamWest includes features on Bill Monroe (p. 45), on the history of bluegrass music (pp 46-7), and on Steve Martin (p. 62). Issue #17 of DreamWest can be read online here. The Danilo Cartia Band will be playing on 26 March 2010 at the Cantine Blues, Via della Batteria Nomentana 66, Rome, and on 27 March at the Stage Pub, Via dell’Olmetta, Formello (RM), north of Rome. Admission is free to both these shows and to the latest Rome Bluegrass Jam, which will be held on 28 March back in Rome at the Cantine Blues. EBMA board member, IBMA award winner Rienk Janssen (of Strictly Country magazine) has released his festival information for the 28th Big Bear Festival, May 24 in the Netherlands. Rienk and a small group of organizers have produced the Big Bear Festival in Zuidlaren, NL since 1982. Strictly Country has been the major sponsor of the festival. The headline act is “Hungry Hill” from Canada. Rienk Janssen started his magazine in the early 1960’s. Strictly Country evolved into a booking agency in the 1970s – 1990s, as well as a recording company. However Rienk currently focuses his energy on his EBMA duties, the SC magazine, a quarterly bluegrass & country music related mail order auction, and retail sales of his huge inventory of books, recordings, videos, etc. All information for this year’s one-day event (including the full program roster) may be found at the Strictly Country website: http://www.strictlycountry.nl/. It’s always a fine intimate gathering and, if the weather cooperates, the festival is held outdoors. Award-winning writer, photographer, and broadcaster Stephanie P. Ledgin - author of Homegrown music: discovering bluegrass and From every stage: images of America's roots music - has recently published Discovering folk music, a survey of folk music in America ranging from the colonial era to '60s protest music to avant-garde 21st-century performers, embracing America's multicultural traditions, and demonstrating the relevance of folk music in everyday life. The book has already been welcomed with very positive reviews. The full jacket description can be read here. For interview or review copy requests, please e-mail. Stephanie Ledgin's many awards and honours include IBMA Print Media Person of the Year (2005). She is also a strong supporter of bluegrass from outside America: a chapter of Home grown music is devoted to international bluegrass. The Swiss old-time/bluegrass band Big Stone [see photos above and below] organised a benefit concert for the Albert Schweitzer Hospital in Lambarene, Africa. It took place in the very well attended catholic church centre in Bülach last Friday, 19 March. In the middle of the program, a gentleman who was working in Lambarene for years sang together with the band Johny Cash's 'Folsom Prison Blues'. After a break, another Swiss band, the Blue Valley Drifters, came on stage and played another set. It was a beautiful evening and I hope that good money came together to help... thanks to Big Stone! It would be nice, if more bands will follow this great idea. Last year in January they held there also a concert to pay the hospital bills for a little girl from Ukraine, named Iwanka. As we could see her at the concert this time too, she is getting much better now. She is waiting for the next operation, living here with her Swiss foster-family. The excellent French bluegrass band Steppin’ Stone plays at the Gewölbekeller in Bühlertal, near Bühl/Baden, Germany. Steppin’ Stone is a trio with Jean Paul Distel (guitar, dobro), Pascal Spitz (vocals, guitar, banjo), and Laurence Gondet (vocals, bass). The concert takes place Saturday 17 April 2010, at 8.00 p.m. Info and tickets: +49-7223-9967-0. The Danilo Cartia Band (I) will be playing at 10.00 p.m. on Sunday 21 March at 'Bibenda', Via Appia sud, 28 - Km 42, 900 Velletri (Rm). Admission free. Thanks to Lilly Pavlak for a report and photos of the concert on 13 March by Laurie Lewis, Tom Rozum, and Red Wine at Interlaken, Switzerland. Many more photos from the show are here, and Lilly's full report of the concert can be read here. A fine photo of Jurgen Biller (banjo) and Joost van Es (fiddle) of 4 Wheel Drive is the illustration for a flyer issued by the Ulster American Folk Park at Omagh, Co. Tyrone, Northern Ireland. 4 Wheel Drive, with Jolanda Peters (vocals), will be 'in residence' at the Folk Park throughout its Easter Celebrations programme, which will run from 10.00 a.m. on Saturday 3 April to 5.00 p.m. on Tuesday 6 April, under the title 'A Spring Fair Day'. The band are no strangers to the Folk Park, having often played there during previous editions of the annual Appalachian and Bluegrass Music Festival. In addition, 4 Wheel Drive will be playing several other dates in Ireland (2-9 April); full details are on the Bluegrass Ireland Blog. The tour is coordinated by Andrew Peters of the Bronte Music Club in Rathfriland, Co. Down. Thanks to Paolo Dettwiler for the news that during the forthcoming European tour by the Krüger Brothers, banjo maestro Jens Krüger will give a banjo workshop at the Stiftung zur Palme, Hochstrasse 31-33, 8330 Pfäffikon ZH, about 30 km east of Zurich, Switzerland. The workshop will be held on Sunday 28 March from 10:00 to 14:00, and will cover the development of arrangements and solos, instrument set-up, timing, speed, backup techniques, banjo styles, and music theory for the bluegrass and country player. Admission costs 90 Swiss francs. Non-banjo-players are welcome! For more information contact Hans Looser by telephone (+41 (0)79 359 24 03) or e-mail. Danilo Cartia & Rome Bluegrass Jam present Laurie Lewis & Tom Rozum on Tuesday 16 March 2010 at 22:00 in the Cantine Blues, Via della Batteria Nomentana N.66, Rome, Italy. 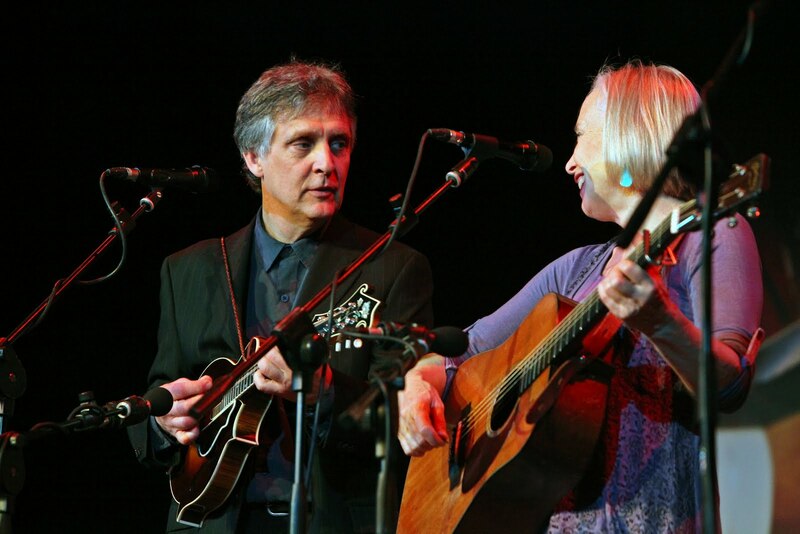 As shown on the European Bluegrass Blog on 1 March, Laurie Lewis & Tom Rozum are a week into their current tour in Europe. Today (Sunday 14 March) they head the lineup for the Bluegrass Jamboree at the Amigdala Theatre, Viale Lombardia 31, 20056 Trezzo sull'Adda (between Milan and Bergamo); and on 19-20 March they will be special guests at the 2nd Red Wine Blue Grass Party at the Teatro della Gioventù, Via Cesarea, 16121 Genoa (Genova). 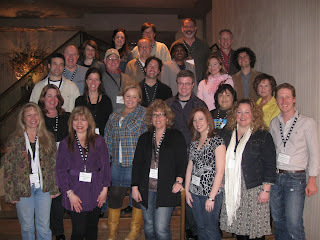 The International Bluegrass Music Association is proud to announce the graduating class of Leadership Bluegrass 2010. Leadership Bluegrass 2010, hosted 9-11 March at BMI in Nashville, Tennessee, was facilitated by Fred Bartenstein, a noted bluegrass historian and professional meeting facilitator, who was also the chosen moderator for the IBMA's International Bluegrass Summit of 2008 and for the first European Bluegrass Summit in 2009. The 2010 class includes Chris Keenan of the Johnny Keenan Banjo Festival, held annually in Longford, Ireland, since 2002. Chris is the only European entrant this year and one of only three class members from outside the USA. In the above photo by the IBMA's Nancy Cardwell, Chris is second from the right in the second row from the front. More details will be appearing on the IBMA website. The Danilo Cartia Band (I) will be playing at 'Blue Frets' on 17 March 2010 (St Patrick's day) at 22:00, in St James’s Irish Pub, Via Flaminia Km 39.100, in the town of Rignano Flaminio, north of Rome on the SS3 (Via Flaminia). The Irish National Guitar Festival, featuring many genres of music, will be held at Drogheda, Co. Louth, Ireland, from Wednesday 7 April to Sunday 11 April 2010. Among the guitarists taking part is Sophia Johnson (right; photo by Jeff G Photography) of the Toy Hearts bluegrass band (UK): Sophia will be playing twice daily in the Yamaha Clinic slot on the Friday, Saturday, and Sunday of the Festival. More details are on the Festival programme. Also taking part in the Festival will be Tom Hanway & his Bluegrass Pals. Tom (USA; resident in Ireland since 2003) was on banjo with Carmel Sheerin & the Ravens when they received the award of #1 European Bluegrass Band at the EWOB Festival in 2005. One of our former members, Jesper Rübner-Petersen, now living and teaching mandolin in Germany, has just had a book on bluegrass mandolin improvisation published by Mel Bay in the United States. It is a well written, thorough book that mandolin players at many levels can learn a lot from. The book contains 200 pages, and comes with a CD, where the numerous examples all can be heard. Jesper has made a MySpace page about the book. We are extremely proud that one of our native sons has produced such a fine bluegrass work. The book can be ordered from the Mel Bay website, where full details can be found. This acoustic quartet demonstrates the worldwide influence of bluegrass music. Labeled a Hungarian bluegrass band, I really would not have known these guys were from across the pond... tight vocals and superb chops... make this album a must have for your collection. Another European reference in the same issue of BU: David McCarty's article on Chuck Ogsbury of Ome Banjos mentions the 'eighty-year-old Swedish woodworker' in Ogsbury's home town of Louisville, KY, who helped him get started in building banjos. Perhaps Swedish bluegrassers should identify and commemorate this craftsman as a Bluegrass Pioneer? The talent committee of the Spring Bluegrass Festival in Willisau, Switzerland, have announced the lineup for their 11th edition on 8 May 2010. The festival takes place on two stages and presents a colourful variety of musical styles focusing on bluegrass music. For further information, see the festival website or contact me directly by e-mail. Thanks to Sophia Johnson of the Toy Hearts (UK) for the four-page March 2010 issue of the band's magazine-format, fully illustrated newsletter, which includes the big news that their third album, Femme fatale, is scheduled for release in June 2010 with distribution from a record label. The Toy Hearts will be touring in the UK and Europe during the summer in connection with the new album before their next trip to the US. Other features include the band's endorsement of BlueChip picks (also featured in the March 2010 issue of Bluegrass Unlimited magazine); Hannah's new Collings mandolin; and many photos from the Bluegrass Jamboree tour in December, and from the Femme fatale recording sessions. The list of forthcoming appearances on page 4 includes the Picnic Festival at Namur, Belgium (3-5 September 2010). View the Toy Hearts' March newsletter here. Thanks to Ondra Plucha for the news that Blackjack (CZ) will begin recording a new CD next week for release at the beginning of May. It will be available at the EWOB Festival 2010 in Voorthuizen, NL. The album features the lineup (Ondra Plucha, guitar; Martin Kubec, banjo; Slavek Podhrasky, mandolin; Richard Podhrasky, bass) which Blackjack have kept for ten years, plus Ondra Kozak on fiddle. Ondra, who plays guitar with Kreni and the Petr Brandejs Band, took part in Blackjack's previous CD and has became a steady guest of the band. Karel Zacal (dobro player of Kreni and also producer of Coner resonator guitars) plays dobro on some cuts. The material of the recording is based on forgotten songs from 1950s bluegrass, as usual with Blackjack. Along with previous recordings, it will be available at Blackjack's live shows or from their website. Blackjack will perform this year at the EWOB Festival in Voorthuizen, NL on 14 May (they received an Audience Popularity Award there last year); at the Banjo Jamboree festival in Caslav, CZ, on 18-19 June; at the Appalachian & Bluegrass Music Festival, Omagh, Co. Tyrone, Northern Ireland on 3-5 September; and hopefully as well for the first time at the La Roche Bluegrass Festival in France on 29 July-1 August. Stephanie P. Ledgin sends the sad news that Sue Woodward of North Carolina passed away peacefully on Tuesday 2 March at 9.30 a.m., after a long fight against cancer. A memorial service will be held on Saturday 13 March at 11.00 a.m. at Duke Memorial United Methodist Church, 504 W. Chapel Hill St., Durham, N.C.
Beppe was able to be at Sue's side on Monday 1 March to offer one last private concert. Read Stephanie Ledgin's full account here. Thanks to Lilly Pavlak for the news that Hickory Project (USA) will be performing at the 2010 La Roche Bluegrass Festival (28 July-1 August) in La Roche-sur-Foron, Haute Savoie, France, where they will also be teaching at the instrument and band workshops. Hickory Project will arrive in Europe on 25 July and would welcome the opportunity to perform in Europe before and after the La Roche festival. If you can offer a booking, please contact the Project's mandolinist, Anthony Hannigan, by e-mail. The 17th Annual Picking Party on 16 January in Leiden was a great success. Pictures are to be found here, here, and here. On YouTube you can find some video fragments. 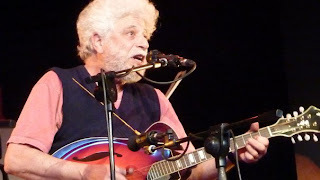 In Valthermond, on 27 March, there will be another picking party, called Northern Picking, with a lot of sessions, and possibly a banjo workshop by Bruno van Hoek. The weekend of 20-22 August the third 'Ins Blaue Hinein' instructional program will be held in the German Eifel mountains, hosted by Paul van Vlodrop, Peter Broekhuijsen, Bruno van Hoek and Elly Beurskens. E-mail: Paul van Vlodrop, Elly Beurskens. The Stroatklinkers will go for a short tour to England in May. The Danilo Cartia Band (I), led by banjoist Danilo Cartia, will be playing at 9.00 p.m. on Thursday 11 March in the Auditorium Due Pini, Via Zandonai, in north-west Rome. Admission: €10. The Auditorium Due Pini presents a varied musical programme - other acts listed in the poster (left) are in the fields of flamenco, tango, mariachi, and the music of Simon & Garfunkel. We are very proud of this new release. More details will soon be available. A track from Courage can be heard through this link to the Utne Reader Music Sampler for March 2010. Liz has set her first steps this week, using a walker. Coming Sunday is her birthday, exactly nine months after arriving in the clinic here in Bad Aibling, Bavaria. We hope she can be moved to a rehab centre before too long, and that she will be home some time this spring. In the meantime she spends a lot of time and energy on the EWOB site and is communicating with lots of musicians and the EWOB committee on a daily basis. The European Bluegrass Blog, on behalf of the EBMA and the bluegrass community throughout Europe, sends heartfelt good wishes for Liz's continued improvement and her eventual complete recovery. The tour schedule for Crooked Still (USA) which was published six weeks ago on the European Bluegrass Blog should have been twice as long. 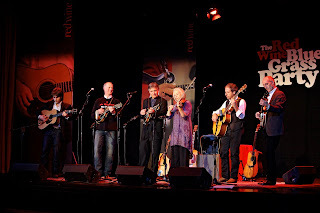 Before the band (leaders in the field of 'alternative bluegrass') begin their dates in the UK and Sweden, they will be making five appearances in the Republic of Ireland, beginning on 15 March. This includes a slot on one of the longest-running programmes on the national TV station. Full details are on the Bluegrass Ireland Blog. Thanks to Dagfinn Pedersen and the Flyinshoes Review americana webzine for the news that US band Chatham County Line (left) has been nominated for Norway's most coveted musical honour, the Spellemann Prize. Brother of song, their collaboration with Jonas Fjeld, is nominated for Country Record of the Year. The awards ceremony is to be held in Oslo at the Spectrum on this coming Saturday, 6 March. While in Norway, the band will also be performing in Drammen (Friday 5 March) and Oslo (Sunday 7 March). Graham Buckley informs us that after his session teaching at Sore Fingers Week (5-9 April), Tony Furtado (USA) (left) will be performing his only UK gig on this visit at the Verge, Cheshire Ring, 72 Manchester Road, Hyde, Cheshire SK14 2BJ, on Saturday 10 April at 8.30 p.m.
Tickets at £10 are available from the venue or on Ticketline. Door price is £12. Tony played this venue in November last year and wished to do a repeat gig there. Enquiries: telephone +44 07802 293 854/0161 368 8769, or e-mail Graham Buckley. Don't miss Four Wheel Drive in concert at Toogenblik this Friday. Four Wheel Drive is one of Europe's top bluegrass bands. And Toogenblik is the greatest place to enjoy acoustic music. Thanks to Lilly Pavlak for taking these and other photos at the 26th International Country Music Festival at the Schützenhaus Albisgütli, Zurich, Switzerland, during the concert on Friday 26 Feb. 2010 - the first of two special Bluegrass Nights, headlined by the Grascals (USA), during the 38-day festival. 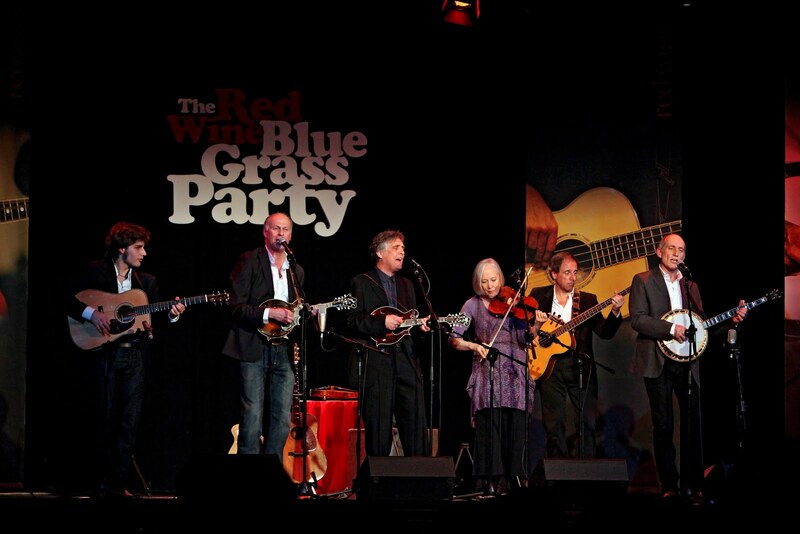 On 27 Feb. the supporting band was the Bluegrass Family (CH). More photos by Lilly can be seen here, including individual shots of the Grascals. For forthcoming appearances by the Danilo Cartia Band, see the EBB post of 16 Feb. Danilo Cartia and Rome Bluegrass Jam are also presenting the concert by Laurie Lewis & Tom Rozum on 16 Mar. We are happy to have been chose by this great band to help them celebrate their anniversary, and play a few other concerts besides! Sun. 14 Mar. : Bluegrass Jamboree, Amigdala Theatre, Viale Lombardia 31, 20056 Trezzo sull'Adda (between Milan and Bergamo), Italy. As the poster (left) shows, the lineup includes Once in a While (Milan) and Bononia Grass (Bologna/Genoa). Doors open at 19:00 and the show starts at 20:00. Admission is €15; a 'Country Barbeque), for an extra €10, can be booked in advance at 331 966 3821. Thanks to Paolo Ercoli of Bononia Grass, who sends us the information of this great event. Fri. 19-Sat. 20 Mar. : 2nd Red Wine Bluegrass Party, Teatro della Gioventù, Via Cesarea, 16121 Genoa (Genova), Italy, 21:00. Tel. 0108936326; fax 0105848721 (see the EBB for 23 Feb. 2010). Thanks to Rienk Janssen for the news that J.B. Beverley & the Wayward Drifters (USA) will be playing in the Netherlands, Belgium, and Germany this month on the dates listed below. The touring band consists of J.B. Beverley (acoustic guitar, lead vocals), Dan 'BanjerDan' Mazer (banjo, dobro, mandolin, backing vocals), and Johnny Lawless (upright bass). Dan Mazer would also be glad to be able to borrow or rent a banjo from a Netherlands musician, for use on the tour. He adds: I recall that one of the pickers there... has Ben Eldridge's old Stelling Staghorn. It would be fun to play that banjo on a tour! Contact Dan via e-mail. 18 Mar. Thea Tielemans, Molenstraat 7, 5427 PV Boekel, Netherlands; 0492 324103; 8.00 p.m.
19 Mar. Stichting Paradiso, Weteringschans 6, 1017 SG Amsterdam, Netherlands 020 6268790; 8.00 p.m.
20 Mar. Koninklijke Harmoniezaal St Cecilia, Kerkstraat 27, 3560 Lummen, Belgium; 0479 32 95 91; 8.00 p.m.
21 Mar. Ace Café Rumst (MySpace), Hollebeekstraat 4, 2840 Rumst, Belgium; 477 582 261; 7.30 p.m.
22 Mar. Antik-Cafe-Bistro, 17 Heyenheimer Weg, 61200 Wölfersheim, Germany; +49 60360982276; 9.00 p.m.
23 Mar. Den Eik, Singel 35, 2275 Gierle, Belgium; 014 55 32 22; 9.00 p.m.
24 Mar. Burgerweeshuis (MySpace), Bagijnenstraat 9, 7411 PT Deventer, Netherlands; 0570 619198; 9.30 p.m.
25 Mar. Dynamo, Catharinaplein 21, 5611 DE Eindhoven, Netherlands; 040 2393110; 9.00 p.m.
26 Mar. 013 Popcentrum, Veemarktstraat 44, 5038 CV Tilburg, Netherlands; 013 4609500; 9.30 p.m.
27 Mar. Stichting Metropool (with Tommy Ebben and the Small Town Villians), Wemenstraat 38, 7551 EZ Hengelo Ov, Netherlands; 0548 544422; 8.00 p.m.
28 Mar. Den Bromfiets (The Motorcycle Café), Harentstraat 51, Bonheiden 282, Belgium; 015 33 14 39; 1.00 p.m.
28 Mar. Bacchus Café, Rozendaal 2, 2440 Geel, Belgium; 014 58 34 83; 8.00 p.m.